SB 51 – Establishing a commission to study expanding mental health courts statewide. SB282 -Relative to suicide prevention education in schools. SB 292 – Relative to implementation of the new mental health 10-year plan. SB 11 – Relative to mental health services and making appropriations therefor. HB 1 – Making appropriations for the expenses of certain departments of the state for fiscal years ending June 30, 2020 and June 30, 2021. & HB 2 -Relative to state fees, funds, revenues, and expenditures. HB 687 – Relative to extreme risk protection orders. SB 177 – Relative to the use of physical restraints on persons who are involuntarily committed. HB 514 – Imposing a waiting period between the purchase and delivery of a firearm. HB 726 – Relative to the secure psychiatric unit and making an appropriation therefor. SB 14 – Relative to child welfare. HB 610 –Relative to treatment alternatives to opioids. HB 652 – Relative to suicide prevention. HB 677 – Relative to discipline of students, addressing students’ behavioral needs, and making an appropriation therefor. SB 59 – Adding post traumatic stress disorder and acute stress disorder to the definition of “injury” for purposes of workers’ compensation and reestablishing the commission to study the incidence of post-traumatic stress disorder in first responders. SB 224 – Relative to insurance coverage for pediatric autoimmune neuropsychiatric disorders. HB 552 – Relative to transparency and standards for acquisition transactions in health care. HB 113 – Relative to qualifications for and exceptions from licensure for mental health practice. SB 5 – Making an appropriation relative to Medicaid provider rates for mental health and substance misuse. HB 131 – Establishing a commission on mental health education programs. HB 240 – Establishing a commission to study the causes of high suicide rates of emergency and first responders. HCR 4 – Encouraging media outlets not to broadcast the name or image of a suspected perpetrator of a mass shooting. HB 218 – Relative to the use of deadly force by a law enforcement officer. HB 349 – Relative to a second opinion on health care matters for state and county prisoners. HB 587 – Relative to conversion therapy seeking to change a person’s sexual orientation. SB 508 – Establishing a committee to study the prevalence of post-traumatic stress disorder (PTSD) and other related disorders among first responders. SB 553 – Establishing a commission to study the incidence of post traumatic stress disorder in first responders and whether such disorder should be covered under workers’ compensation. SB 313 – Reforming New Hampshire’s Medicaid and Premium Assistance Program. HB 1319 – Prohibiting discrimination based on gender identity. SB 480 – Limiting the use of electroconvulsive therapy. SB 487 – Relative to license requirements for certain alcohol and other drug use professionals and establishing a state substance use disorder treatment services program. View the 2018 State of the State address. You can click here to skip to the section addressing mental health. NAMI New Hampshire has a long history of opposing the transfer of patients from New Hampshire Hospital to the care of the Department of Corrections (Secure Psychiatric Unit). Specifically, we are opposed to the commingling of individuals with mental illness who are committed under Involuntary Emergency Admission (IEA) with those who are criminally committed. We have provided written and oral testimony at numerous legislative hearings to this effect. 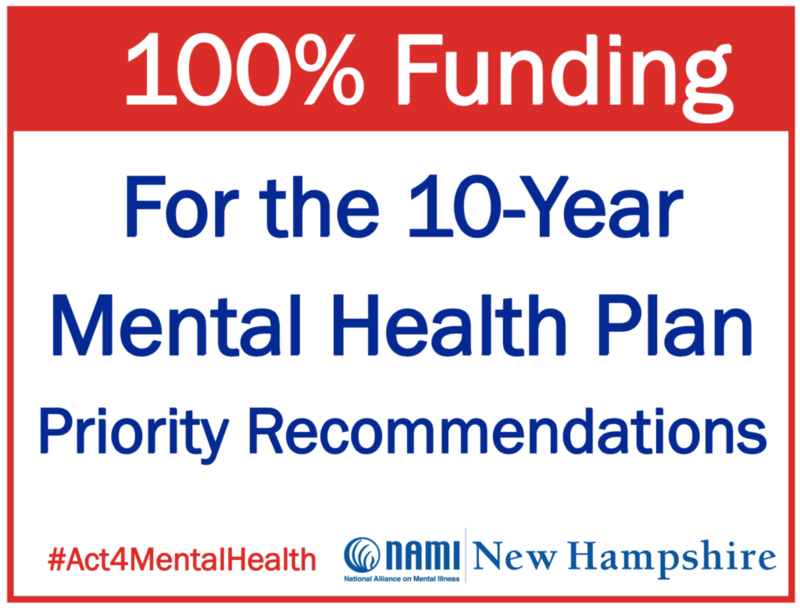 NAMI NH continues to advocate for more resources to improve access to appropriate levels of care across the entire mental health system. 2016 Letter Co-authored by NAMI NH, American Civil Liberties Union of NH, Disability Rights Center, and NH Legal Assistance. Excerpt: "We write to express our opposition to the continued transfer of civilly committed patients from New Hampshire Hospital to the Secure Psychiatric Unit in the New Hampshire State Prison..."
The New Hampshire Department of Health and Human Services (DHHS) has released a final version of the new 10-Year Mental Health Plan. Read the plan on the DHHS website. Support the re-authorization of the NH Health Protection Program; also known as Medicaid Expansion; particularly the opportunity it offers for Substance misuse treatment and mental health treatment. Over 38,000 NH citizens are now insured and receive mental health services. Provides insurance to NH’s working poor who cannot afford it. Covers mental health and substance misuse disorders. Saves money by lowering uncompensated hospital care. Be prepared to wait to testify and leave your printed testimony if time runs out. Fund the implementation of the “10 Year Plan”. Fund the Mental Health Settlement Agreement. Arrive early to sign in to speak there will be a waiting list. The template below may assist you when preparing your testimony. After you prepare it, consider sending a copy to advocacy@naminh.org.